Even in these times of high technology and enough gear to fill a fish-room, we are still reliant on humble microbes to help us keep our aquariums healthy and clean. A simple, yet absolutely essential process in putting up a new aquatic system is the introduction and culture of these beneficial bacteria. Where do they come from? How do you get them to populate your new tank and keep them going? As you will find, there are almost as many opinions on how to "cycle" your new system as there are ways to do it. Yes, there are many "roads" to establishing cycling, some simpler, safer, surer, faster then others. Here's my take on the most common paths. Rationale: Who Are These Guys, Why Do I have To Know About Them? A short version of the story: Fish and invertebrate livestock produce ammonia (NH3, NH4OH) as their principal excretory product… This material is unfortunately quite toxic to them… and it's too expensive, inconvenient to remove it by dilution, chemical filtration. Happily, there is a group of microbes/bacteria that in good numbers can convert the toxic ammonia waste products into nitrites (NO2 compounds) aerobically (by adding oxygen so to speak). Unfortunately nitrites are also quite toxic to animal life, but again, we are lucky that another set of beneficial microbes exist that readily convert nitrites to nitrates ("nigh" "traits", NO3 compounds). As it turns out, accumulated nitrates are not nearly as toxic to marine (or freshwater, brackish) life as their precursor molecules. A good value to aim for is to try and keep your nitrates below 10 ppm, but fishes especially (compared with many invertebrates) when "graded up" to a higher value may show no negative signs when chronically exposed to a few tens of ppm of nitrate. To assure this last point is clear. Having low (less than ten ppm) nitrate is desirable, but not essential with fish only, live rock and algae systems. Your goal in preparing an environment suitable to support your animal livestock is to first get populations of these two bacteria groups going in your new aquarium. 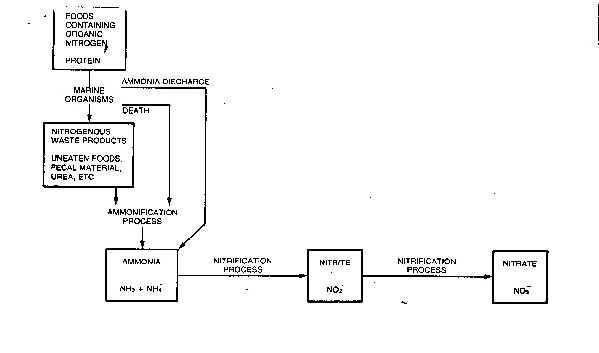 Flowchart of common pathway in processes of nitrogen cycling. Foods made of proteins, which in actuality are composed of amino acids (note similarity in names amino and ammonia, amino acids are made up of chains of carbon, plus hydrogen, oxygen, sometimes sulfur joined to each other by amino bonds... the source of ammonia in catalysis, the breaking down of proteins at the molecular level) whose breakdown, re-building produces ammonia (as well as urea, uric acid...) as a waste by-product. This ammonia is discharged in various forms, leaked into the environment (water) as shown. Through aerobic processes, microbes of two different groups convert ammonia (ionized and not) to nitrite, and another group from nitrite to nitrates. A full discussion of all the ways people have devised and utilized to establish bio-geo-chemical nutrient cycling would fill several tomes. We're not going to do that. Below are the three most common, surest and safest groups of ways to get you "there". Before we go any further a statement needs be made re "patience being a virtue" and time going by to grow the microbes you need. "It takes time"… all these and all other methods. No matter what anyone states, what super-duper product they have to offer, all the ways to get beneficial bacteria to become thoroughly established require a couple to several weeks to accomplish. Be patient. Best to set your system up with just freshwater, attach the various mechanicals (filter, aeration, circulation, heating, lighting… gear) and test all for a day or so to make sure you have everything, and that it works… Assured, go ahead and add the substrate/s, salt mix or real saltwater, and other items and leave this all going for a good week, allowing the various components and water to "settle in" before purposely going about adding your microbes. More important than any given temperature (within reason) is some sense of stability. Keeping your system in the upper part of "typical tropical seawater" range (upper seventies to lower eighties F) and not allowing it to vacillate more than a few degrees per day will optimize (shorten) the period of time it takes to fully cycle it. These nifty "products" are natural bits of the reef… they come replete with all sorts of life in/on them… and are able to spread, populate your new system with the greatest of ease. Even for "fish only" systems, a pound or more per ten gallons of either or both LR/LS is about all that's called for to get things going. How to apply the rock and/or sand? Plunk, sprinkle them in. Done. Time Frame: May be zero, as in "instantly cycled", to a few (2-3) weeks generally. If you can be sure that a friend, friendly store has no standing issues with pests, parasites, you might utilize some of their "used" filter media, sand/gravel, and "muck" (the gunk that can be vacuumed out from the bottom) to establish nitrogen cycling. Such precious material should be handled as if it were livestock, kept from extremes of temperature, moved in water… to your new system. The microbes and foods in the used media will populate your new system by themselves, or for bonus points, you can use this method combined with the live rock and/or sand listed above. Time Frame: Typically a few (3-4) weeks. There are commercial preparations of bacteria, their adjuncts available that you can add from a bottle directly to your system… Some work pretty well most of the time (Dr. Tim's "One and Only", his Marineland equivalent "Bio-Spira") , others are "not so reliable (e.g. Hagen's Cycle "¢ and fresh Fritzyme "¢). How can you tell if yours is working? See "Testing" below. It might go w/o saying that using the two protocols above: "Live Rock/Sand" and/or "Used Media" with these culture/products is better than any one approach, but I said it just the same. Time Frame: May seem like right away... but best to wait a good two weeks after using these products, measure some accumulating nitrate, possibly algal growth as indications that the system has "really" cycled enough. In the Dark Ages, back in the 1950's, when such pet-fish luminaries as Robert Straughan were discovering and disseminating how to set-up working marine systems, people fell into the habit of using "tougher" livestock like Damselfishes (family Pomacentridae), Anemones… even brackish Turtle species to provide starter and ongoing ammonia to establish nutrient cycling. Turns out, these organisms aren't necessary, nor advised. There is plenty of ammonia available from live rock, live sand organisms, old/used media, and even starter cultures. Why risk introducing a parasite, pest or pollution to your new system by using live animals here? Don't. Some folks endorse adding fish food, a bit of cocktail shrimp (sans sauce), even exogenous (like household cleaners) sources of ammonia to spur things on… All of these can help applied in moderation. Use a small amount (a pinch) per ten gallons at first (this is all that is necessary) and follow one of the proscribed methods above. Time Frame: Generally 4-6 weeks. Again, a good idea to use test kits to monitor progress, and wait on the rise of nitrate, some algae growth to assure you the system is cycled. How are you going to be able to "tell" what's going on in/with your water and these microbial populations? By "testing the waters" of course. Do get and use ammonia, nitrite and nitrate test kits for saltwater and document the likely (you might not detect this) rise in ammonia concentration with time, then its drop to zero, an increase in nitrites, and their drop and the inevitable (and welcome) presence and increase in nitrates. When the ammonia and nitrites have gone to zero parts per million (ppm) and there is appreciable nitrates (a few ppm), and likely the beginning of algal growth, you are ready to start stocking your new system… probably with a few "cleaner uppers" to start. Test Kits: Vary tremendously in their accuracy (measuring what's there) and precision (consistently measuring it). By and large, the simple colorimetric and dip-test kits available to the hobby are fine (accurate, precise enough) for home hobbyist use. There are more sophisticated devices, more accurate, precise kits available as you might surmise. The manufacturer/brands Hach, LaMotte and Salifert are excellent examples of "higher-end" test kits. Many "bad things" can and do happen when a system has too much too soon in the way of wastes to process. In a nutshell, too much ammonia, nitrite or nitrate is outright poisonous to your livestock. Having just appreciable ammonia or nitrite is deleterious/harmful to growing extents, the more you have, the more dangerously toxic your water is. The same holds true with more nitrate. The more you have, the less viable/healthy your aquarium water is. Take care to not place too much livestock too quickly (variable with type of system, filtration...), nor too much in the long haul, nor over-feed the system... as all can and will cause trouble with overloading your biological filtration (among other things). Too Late! Ammonia, Nitrite Too HIGH!!! Should you ever find your system ammonia or nitrite concentrations approaching 1.0 ppm due to overloading, mis-feeding, a "crash" of your beneficial microbes, there is need for rapid action on your part. You have a few options, trying to reduce the toxic compounds through dilution, addition of anaerobic bacteria, adding macro-life to absorb the chemicals, selective chemical filtration, or moving the livestock to a system where there are less toxic conditions. Dilution Solution: This is a matter of removing the ammonia, nitrite laden water and replacing it with pre-made synthetic or natural seawater that has none. A good stop-gap measure, but not a long-term solution. You want to find the root cause/s of the problem and solve them. Adding More Beneficial Microbes: Can be done by placing more cured live rock, and/or clean "old" substrate or filter media, or cycling products. Adding Bio-Absorbers: Macro-Algae are probably the best known forms of photosynthetic life that can be added safely to help "take up" ammonia, nitrite. Caulerpa and Halimeda spp. in particular are good for this purpose. Chemical Filtrants: Exist for removing ammonia and nitrite. See your local fish store, internet e-tailers for these materials. They're placed in your filter flow path to maximize removal. Once again, realized that this is again a "stop-gap" measure, that you need to find, solve the source of the bottle neck in your cycling. Moving Livestock: Obviously a good, practical approach GIVEN you have room elsewhere in a fully-cycled, stable system. Not Adding to the Problem: If you're suffering an ammonia or nitrite "anomaly" don't multiply the difficulty by contributing further to it. DO NOT place any more ammonia/nitrite producing livestock, and DO NOT feed the system. It's far better for your livestock to go w/o feeding than be subjected to further poisoning. "What", I can hear you thinking, "is this all there is"? Simple enough. Certainly there are other approaches to nitrogen, nutrient cycling… You can find "fuller", more detailed explanations and input on the Internet, general books on marine aquarium keeping and specialty hobbyist magazines. Don't let the issue of cycling throw you. All it takes is time, patience and some starter source of the microbes involved. Anon. 1984. Practical filter run-in methods. SeaScope v.1 Summer, 84. Blok, J. 1986. Biological filtration for the marine aquarium. FAMA 9,10,11,12/86. Dewey, Don. 1978. Establishing the biological filter. FAMA 1/78. Dixon, Beverly and David Straub. 1998. Nitrifying bacteria: the sequel. FAMA 8/98. Gamble, Sam. 1995. Sand bed filter: Biological filtration revisited. FAMA 4/95. Greco, Frank. 1988. The role of biological filtration in closed system aquaria. FAMA8,9/88. Hovanec, Timothy. 1996. New trends in biological filtration. AFM 2/96. Hovanec, Timothy. 1997. Nitrifying bacteria, Pt. 1, without them there is no aquariumhobby. Hovanec, Timothy. 1997. Nitrifying bacteria, Pt. 2, the mystery of the missing bacteria.AFM 1/97. Hovanec, Timothy. 1998. Who are the bacteria really responsible for nitrification in an aquarium? The Pet Dealer 9/98. Hovanec, Timothy. 2000. It's all in the microbes. AFM 6/00. Jenno, Anthony J. 1976. Biological filtration, Pts 1-3, Marine Aquarist 7:6, 7,8, 76. Kassebeer, Gerd. 1987. An analysis course for aquarists. Filter biology. Today's Aquarium- Aquarium Heute, 1/87. Siddall, Scott. 1973. Recent research in biological filtration. Marine Aquarist 4:1, 73. Thiel, Albert. 1992. Suggestions on cycling aquariums. FAMA 8/92.